Survivor: Cook Islands (2006) - 2nd place, four jury votes. 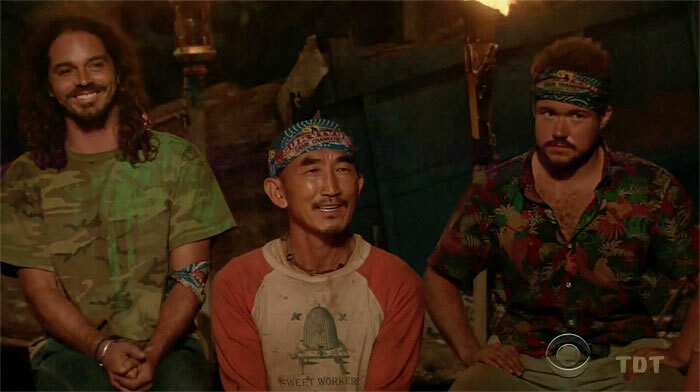 Received 4 jury votes, to finish 2nd (5-4-0) in Episode 15, "This Tribe Will Self-Destruct in 5... 4... 3..." (Day 39). Survivor: Micronesia-Fans vs. Favorites (2008) - 9th place, 12th out - 2nd juror. Voted out in Episode 10, "I Promise..." (Day 27). Survivor: South Pacific (2011) - 4th place, 15th out - 9th juror. Voted out (voluntarily) in Episode 7, "Trojan Horse" (Day 19). Returned to the game in Episode 8, "Double Agent" (Day 20). Voted out again in Episode 9, "Cut Throat" (Day 22). Returned to the game (again) in Episode 14, "Loyalties Will Be Broken" (Day 36). Voted out for the third & final time in Episode 14, "Loyalties Will Be Broken" (Day 38). Cumulative totals: In-game - 23 days; Redemption Island - 15 days. Survivor: Game Changers (2017) - 12th place, 9th out - 2nd juror. Voted out in Episode 9, "There's a New Sheriff in Town" (Day 24). Cook Islands Ep. 1 RC/IC: "Lock and Load Light" - Aitu finishes second (2nd*/4). Cook Islands Ep. 2 RC/IC: "Tow the Line" - Thanks to Ozzy, Aitu "loses" (thrown challenge, 4th/4). Cook Islands Ep. 3 IC: "Steeple Chase" - Now with new Aitu, runs, but eventually Aitu loses. Cook Islands Ep. 4 RC: "Strung Along" - Swims, Aitu wins! Cook Islands Ep. 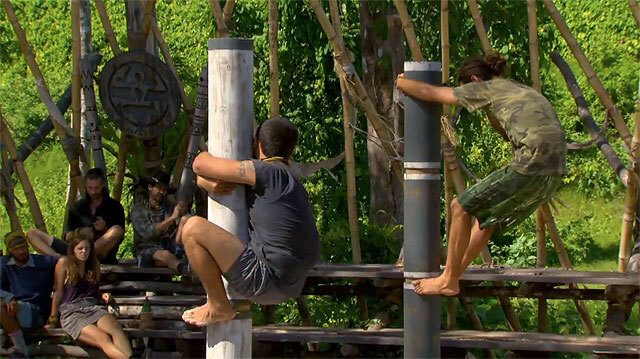 4 IC: "Mayday" - Swims to rescue Candice, easily outpacing Raro, Aitu wins again..
Cook Islands Ep. 5 RC: "Never Tear Us Apart" - Paired with Flica, who is the last Aitu to drop her weight (20 lbs), and eventually, Aitu loses. Cook Islands Ep. 5 IC: "United We Stand" - Holds the poles, Aitu wins. Cook Islands Ep. 6 RC: "Kicking and Screaming" - Holds onto a pole for Aitu; Aitu wins. Cook Islands Ep. 8 RC: "Smash and Grab" - Smashes and grabs, as Aitu wins again. Cook Islands Ep. 8 IC: "Stairway to Heaven" - With Yul and Candice, gives Aitu a lead on the zipline; Aitu loses. Cook Islands Ep. 9 RC: "Barrel of Monkeys" - With Yul, rolls the barrel; Aitu wins! Cook Islands Ep. 9 IC: "Depth Charge" - Once again, Aitu wins. Cook Islands Ep. 10 RC: "Make Your Point" - Paired with Becky, and again, Aitu wins. *Note: Second-place finishes in four-tribe phase of Cook Islands count as a half-win. Cook Islands Ep. 11 IC:, "Mast Cling On" - Ozzy wins, after Candice drops out at 135 minutes (1st/9). Cook Islands Ep. 13 RC: "Pass the Bucket" - Teamed with his mom, still manages third place (3rd/7). Cook Islands Ep. 13 IC: "Flotsam & Jetsam" - Ozzy wins! (1st/7). Cook Islands Ep. 14 RC: "Mud Run" - Ozzy wins, almost doubles Parvati's second-place total (45 lbs to 24 lbs; 1st/6). Cook Islands Ep. 14 IC: "Cannonball Run" - Outpaces Yul, and once again, Ozzy wins (1st/6). Cook Islands Ep. 15 F5 IC: "Compass Ropes" - Ozzy wins again (1st/5). Cook Islands Ep. 15 F4 IC: "Self-Destruction" - Ozzy wins one last time, after Sundra drops at 2.5 hours (1st/4). 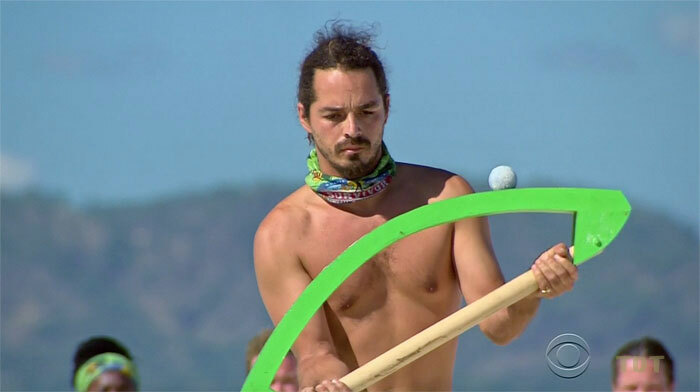 • RECORD: Ozzy's five consecutive individual challenge win streak (including the Ep14 RC and the last four ICs) in Cook Islands is tied with Kelly Wiglesworth (Borneo) and Bob Crowley (Gabon) for first place all-time. 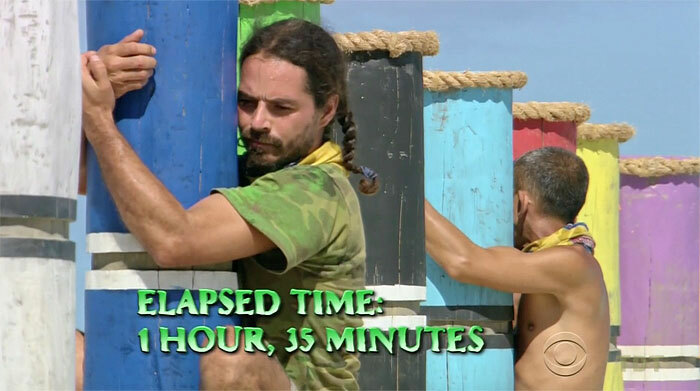 • RECORD: Ozzy's five total immunity wins are tied for most in a single season, all-time, with Colby Donaldson (The Australian Outback), Tom Westman (Palau), Terry Deitz (Panama-Exile Island), Mike Holloway (Worlds Apart), and Brad Culpepper (Game Changers). Micronesia Ep. 1 RC/IC: "Reinventing the Wheel" - Pushes the cart for Malakal, Malakal loses. Micronesia Ep. 2 RC/IC: "Smash and Grab" - One of Malakal's tile smashers, and Malakal wins. Micronesia Ep. 3 RC: "Beach Bash" - Competes, Malakal wins. Micronesia Ep. 3 IC: "Nut Bucket" - Shoots baskets, but Malakal's four can't hold theirs. Malakal loses. Micronesia Ep. 4 RC: "Diver Down" - Gets 4 of Malakal's 10 coconuts himself, and moves rest to the end; Malakal wins. Micronesia Ep. 4 IC: "Crosswalk" - One of Malakal's six walkers/necklace retrievers. Malakal wins. Micronesia Ep. 5 RC: "Cat and Mouse" - Now switched to New Malakal, which loses. Micronesia Ep. 5 IC: "A Stone's Throw" - Malakal loses again. Micronesia Ep. 6 RC: "Build It Up, Break It Down" - Another Malakal loss. Micronesia Ep. 6 IC: "United We Stand" - Malakal loses again. Micronesia Ep. 7 RC: "Money Roll" - Finally, Malakal wins one. Micronesia Ep. 7 IC: "What-Er Drag" - Malakal resumes its losing ways. Micronesia Ep. 10 RC: "Bai Bai" - Part of the winning team, with Erik, Jason, and Amanda. Micronesia Ep. 1 Individual IC: Does not find Malakal's necklace/idol thing (tie-3rd/10). Micronesia Ep. 9 IC: "Last Gasp" - Narrowly finishes second to Jason (2nd/10). Micronesia Ep. 10 IC: "When It Rains, It Pours" - Sixth person to drop out (at 1 hour, for donuts; 4th/9). South Pacific Ep. 1 IC: "Coconut Conundrum" - Chops rope, shoots baskets, but Savaii narrowly loses. South Pacific Ep. 2 RC/IC: "Crate Escape" - Savaii wins. South Pacific Ep. 3 RC/IC: "Hitching a Ride" - Collects bags and rides the kickboard, Savaii loses. South Pacific Ep. 4 RC/IC: "Shoulder the Load" - Loader, Savaii wins. South Pacific Ep. 5 RC/IC: "Pig Out" - Savaii can't gnaw as much spit-soaking pork as Upolu, and loses. South Pacific Ep. 6 RC/IC: "Losing Face" - Wheelbarrow duty with Dawn and Cochran, Savaii wins. South Pacific Ep. 7 RC/IC: "Family Ties" - Paired with Whitney, throws a fit when Savaii loses. South Pacific Ep. 8 IC: "Coconut Cradle" - Ozzy wins the men-specific necklace (1st/8). South Pacific Ep. 9 F11 IC: "Get Crackin'" - Eliminated in the first round (bottom 7/11). South Pacific Ep. 14 F5 IC: "Teeter Tower" - Ozzy wins (1st/5). South Pacific Ep. 14 F4 IC: "Lei of the Land" - Chokes on the puzzle, finishes second (2nd/4). South Pacific Ep. 1 RC: "Thrilogy" - Ozzy beats Coach in the "hero challenge" (1st/2). South Pacific Ep. 8 Duel: "Jail Break" - Ozzy wins, breaks Christine's 5-win streak, re-enters game as planned (1st/2). South Pacific Ep. 10 Duel: "Keep It Up" - Ozzy wins, sends Keith and Jim to the jury (1st/3). South Pacific Ep. 11 Duel: "Offer It Up" - Ozzy wins, sends Dawn and Whitney to the jury (1st/3). South Pacific Ep. 12 Duel: "Puppet Master" - Ozzy wins, narrowly beats Cochran (1st/2). South Pacific Ep. 13 Duel: "Block It Out" - Ozzy wins, beats Edna (1st/2). South Pacific Ep. 14 Duel: "Get a Grip" - Ozzy wins, beats Brandon, re-enters game again (1st/2). 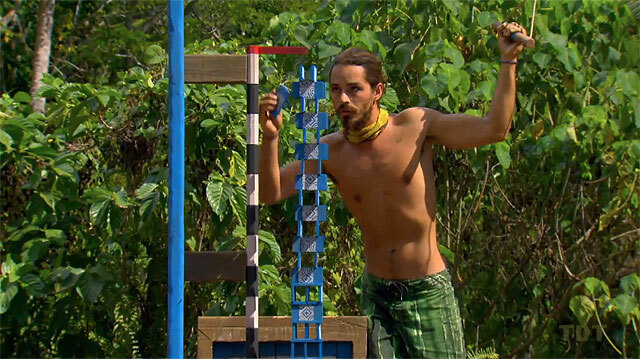 RECORD: Ozzy's six consecutive duel win streak is tied with Matt Elrod (Redemption Island) for most all-time. Game Changers Ep. 1 RC/IC: "Blue Lagoon Bustle" - Swims for the key, crosses obstacles, and Nuku wins! Game Changers Ep. 4 IC: "Ow Pairs" - Retrieves bags, plates a ball on the table maze, and Tavua wins! (1st/3). Game Changers Ep. 5 RC: "Unchained Medley" - Crosses the beam with the bow, and Tavua wins (1st/3). Game Changers Ep. 5 IC: "Box Car Blues" - Slingshots the final four targets for Tavua, which doesn't lose (2nd*/3). Game Changers Ep. 7 RC: "Dulcimer Stomp" - Places all five balls with the catapult, and Nuku wins. Game Changers Ep. 7 IC: "Plunge, Pop, Pull" - Gives Nuku a huge lead diving for buoys, but Nuku loses. Game Changers Ep. 9 RC: "New School" - With Troyzan, unties and hauls the net for the winning team. Game Changers, Ep. 8 IC: "Keep on Your Toes" - Seventh person to drop out (7th/13). Game Changers, Ep. 9 IC: "Get a Grip" - In his third try at this challenge, Ozzy falls just short at 1:35 (2nd/12). Cook Islands, Ep. 2: One vote, from Billy. Cook Islands, Ep. 15: Received four jury votes, from Parvati Shallow, Nate Gonzalez, Jenny Guzon-Bae, and Rebecca Borman, to finish second, 5-4-0. Micronesia, Ep. 4: Exiled, follows the series of clues while Kathy rests, digs up the hidden idol (Day 6). Micronesia, Ep. 4: Makes and re-hides a fake hidden idol, which Jason later finds (Day 7). Micronesia, Ep. 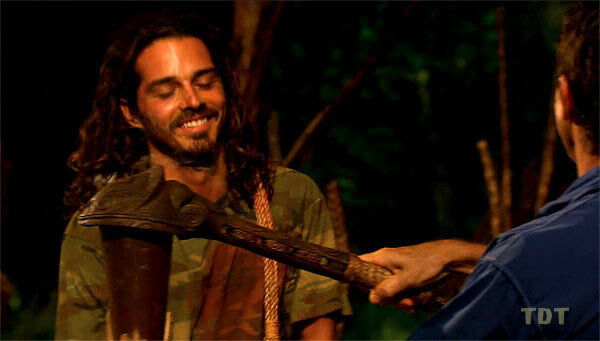 10: Voted out, with the real idol safely stored back at camp (Day 27). Micronesia, Ep. 1: One vote, from Fairplay. Micronesia, Ep. 7: One vote, from Tracy. Micronesia, Ep. 9: Two votes, from Eliza and Jason. Micronesia, Ep. 10: Five votes, from Parvati, Cirie, Natalie, Alexis, and Jason (voted out, 5-4). Micronesia, Ep. 14: Voted for Amanda Kimmel (who lost, 5-3). South Pacific, Ep. 3: Papa Bear Caruso (voted out, 6-1-1). South Pacific, Ep. 7: Five votes, from Cochran, Whitney, Dawn, Jim, and Keith (voted out, voluntarily, 5-1). South Pacific, Ep. 9 (F11 vote): Nine votes, from Sophie, Coach, Albert, Rick, Brandon, Edna, Cochran, Whitney, and Dawn (voted out again, 9-2). South Pacific, Ep. 14 (F4 vote): Three votes, from Sophie, Coach, and Albert (voted out for the third time, 3-1). RECORD: Ozzy's three times being voted out in South Pacific is the all-time record for a single season. Ozzy also holds the record for most times voted out in a Survivor career (five times). South Pacific, Ep. 14: Voted for Sophie Clarke (who won, 6-3-0). Game Changers, Ep. 9: Seven votes, from Brad, Debbie (x2), Sarah, Sierra, Tai, and Troyzan (voted out, 7-4-1-1). Game Changers, Ep. 14; Voted for Brad Culpepper, who finished second (7-3-0). Come on guys, hurry up and beat us! Darn. We lost. What a shame. You voted out Cecilia? Not cool, guys. Great story, Candice. Totally believable. Hey guys! We're here! Got any food for us? We get to kidnap someone, too? Found a bird. Let's eat it? Have fun on Exile again, Candice! Aitu gets one last tribal win! What? You have the idol, Yul? They expect me to wait on them, or something. Why would I do that? Ep13 Tribal Council. So long, Penner. The winner is obvious. Duh. Me? A threat to win challenges? Come on. Ep14 Tribal Council. Goodbye, Parv. I'm going to the Final Four! Enjoying the Day 38 sunrise. Well. THOSE won't be showing on eBay. Stay here, Kathy. I'll go look for some... food. Yeah. This is totally gonna save me! You'd better win this challenge, 'Hero.' That's what you're here for. Working the puzzle while getting yelled at from the stands. No pressure. Dammit! I REALLY wanted to watch that Adam Sandler movie! So... we've got each other's backs... right, Coach? Eh, who cares. Redemption Island is crawling in giant fish. Having fun at RI. Wish you were here. Why did Tai tell Varner we're voting Sandra? Dumb! Staci Krause at IGN.com (12/18/06): "Exclusive Survivor: Cook Islands Interview: Ozzy"
Christine Seghers at IGN.com (4/22/08): "Survivor: Micronesia Interview - Ozzy"
Rhoda Charles at TVGuide.com (4/23/08): "Ozzy: 'I Didn't See It Coming'"
Gordon Holmes at XfinityTV.com (9/12/11): "Pre-Game Interview: Ozzy Lusth"
Dalton Ross at EW.com (9/12/11): "Ozzy on what went wrong with Amanda and whether there will be 'jungle love' this time around"
Rob Cesternino at RHAP (12/19/11): "Post-Finale Interviews with Sophie, Brandon, Rick, Albert, Coach & Ozzy"
Dalton Ross at EW.com (12/19/11): "Is Ozzy arrogant? Let's ask him!" Daniel Fienberg at HitFix.com (12/20/11): "Ozzy Lusth talks Survivor: South Pacific"
Josh Wigler at Parade.com (2/14/17): "Ozzy Lusth Is Wishing and Fishing for the Win"
Gordon Holmes at XfinityTV.com (2/20/17): "Ozzy: 'I've Got to Make Sure That I'm Friends with Everybody'"
Erin Cebula at ETCanada: "Ozzy Lusth - ETCanada Interview"
Gordon Holmes at XfinityTV.com (4/20/17): "Ozzy: 'Debbie Is Like a Crazy Cat Lady Without the Cats'"
Josh Wigler at Parade.com (4/20/17): "Ozzy Lusth Recalls His Hard Fall"
"Born in Mexico, Oscar 'Ozzy' Lusth moved 10 times in his teen years to seven U.S. States and Central America while his mother remarried. He attended two years of college at Santa Barbara City College before moving to the Los Angeles area. Lusth currently resides in Venice, California with his German Shepard mix, Buddha (who also accompanies him on his board while surfing). His birth date is August 23, 1981." "Lusth is currently working as a freelance photographer and writer. He enjoys big wave surfing, skateboarding, sailing, snowboarding, wakeboarding, gymnastics and motorcycle riding. He owns land in Panama and enjoys going there to spearfish. He can dive to 30 feet and can hold his breath under water for three minutes. He is skilled at building traps, forts, shelter and surviving in the wilderness on his own. In the summer of 2005, he camped all the way from Panama to San Diego over the course of five months. Over the past year, Lusth has begun to develop a non-profit organization to build skate parks in Mexico." What does he think of Coach, his competition? 'Honestly, I’m actually pretty excited that Coach is here. He can be a polarizing character but I think that he respects the way that I play the game, and I respect the way he plays.'" I will build my original alliance more carefully."